The S&P CoreLogic Case-Shiller U.S. National Home Price Index for August showed an annual appreciation rate that was lower than 6.0 percent for the first time in a year. The rate fell from 6.0 percent in July to 5.8 percent in the index which covers all nine U.S. census districts. On a month-over-month basis the National Index was up 0.2 percent on a non-seasonally adjusted basis and was 0.6 percent higher than in July when seasonally adjusted. The 10-City Composite Index dropped from an annual gain of 5.5 percent in July to 5.1 percent in August while the 20-City Composite declined to 5.5 percent from 5.9 percent. On a monthly basis both indices were unchanged from their July readings on a non-seasonally adjusted basis, but each rose 0.1 percent after adjustment. Twelve of the 20 cities tracked by the index reported increases before seasonal adjustment, while 17 of 20 cities did so afterward. Las Vegas, San Francisco and Seattle again had the highest year-over-year gains. Las Vegas reported a 13.9 percent annual increase followed by San Francisco with a 10.6 rate of appreciation and Seattle, up 9.6 percent. In four of the 20 cities appreciation accelerated in August when compared to the 12 months ended in July. David M. Blitzer, Managing Director and Chairman of the Index Committee at S&P Dow Jones Indices provided the following analysis of the August findings. "Following reports that home sales are flat to down, price gains are beginning to moderate. Comparing prices to their levels a year earlier, 14 of the 20 cities, the National Index plus the 10-city and 20-city Composite Indices all show slower price growth. The seasonally adjusted monthly data show that 10 cities experienced declining prices. Other housing data tell a similar story: prices and sales of new single family homes are weakening, housing starts are mixed and residential fixed investment is down in the last three quarters. Rising prices may be pricing some potential home buyers out of the market, especially when combined with mortgage rates approaching 5 percent for 30-year fixed rate loans. "There are no signs that the current weakness will become a repeat of the crisis, however. In 2006, when home prices peaked and then tumbled, mortgage default rates bottomed out and started a three year surge. Today, the mortgage default rates reported by the S&P/Experian Consumer Credit Default Indices are stable. Without a collapse in housing finance like the one seen 12 years ago, a crash in home prices is unlikely." As of August, average home prices for the metropolitan statistical areas within the two composite indices are back to their winter 2007 levels. The 20-City Composite Index is now 3.5 percent above its previous peak in July 2006, and the 10-City is 0.4 percent higher. The National Index, up 11.5 percent from its pre-crash peak, has risen 53.6 percent from its low in February 2012. 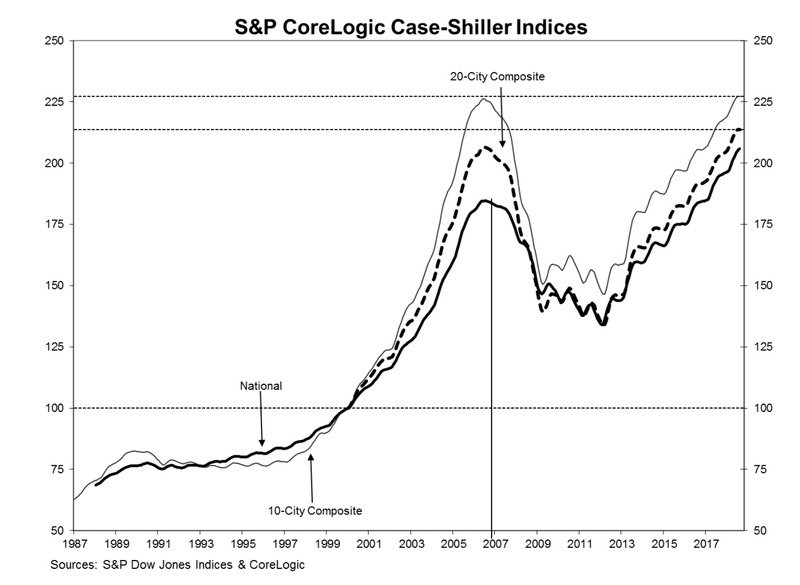 The S&P CoreLogic Case-Shiller Home Price Indices are constructed to accurately track the price path of typical single-family home pairs for thousands of individual houses from the available universe of arms-length sales data. The National U.S. Home Price Index tracks the value of single-family housing within the United States. The indices have a base value of 100 in January 2000; thus, for example, a current index value of 150 translates to a 50 percent appreciation rate since January 2000 for a typical home located within the subject market. The National Index set another new record in August, a reading of 205.81. July's peak was 205.35 . The 10- and 20-City Composites had readings of 227.17 and 213.72 respectively. Los Angeles claims the highest index at 283.40. Cleveland had the lowest reading at 124.20.